Is the Venture Capital Market Getting Its Mojo Back? The venture capital market appears to be bottoming out after a long decline, according to a Fenwick & West survey of the venture capital market for the third quarter of 2009. There are two significant data points worth pulling out. First, the number of investment rounds for higher valuations (i.e. “up rounds”) exceeded the number of investment rounds for lower valuations (i.e “down rounds”) for the first time this year. Up rounds exceeded down rounds 41% to 36%, according to the survey. In the second quarter, down rounds exceeded up rounds 46% to 32%. This the equivalent of a rising valuations in the stock market, suggesting that VCs are getting more optimistic about the value of venture-backed startups. The second related point is that the average price of venture deals increased 11%, the first increase this year. That compares to a 6% decline in the second quarter, and a 3% decline in the first quarter. Read the rest of the blog post here on BusinessWeek’s TechBeat. Earlier this year, Silicon Valley freaked out when U.S. Treasury Secretary Timothy Geithner told Congress that large venture capital firms should be declared as systemic risks and put under tight restrictions as part of the broader re-regulation of financial firms. That was good news for innovation. VCs do not pose a systemic risk to the economy, as Gordon Crovitz pointed out in this astute column in the Wall Street Journal. The venture capital industry is small compared to other capital markets. VCs do not use debt, so that sharply limits their risk. And they are not tightly interconnected with other financial firms, like AIG or Lehman Brothers. But they do represent an incredibly important part of the economy that helps generate significant wealth and job creation–a unique economic pillar the Treasury Dept. should be strengthening, not weakening. Financial reform hinges on, you guessed it, the passage of health care reform. “Many Senators sit on both Committees of jurisdiction so can’t focus of financial reform until they see how health care proceeds,” added Heesen. Today, Paul Kedrosky released a report, “Right-Sizing the Venture Capital Industry,” as part of his work as Senior Fellow at the Kauffman Foundation. Now, I couldn’t agree more that the venture capital industry needs to reinvent itself. That was the theme of my recent feature in BusinessWeek, Super Angels Shake up Venture Capital. But I was a little surprised by the way that Kedrosky goes out of his way to diss the venture capital industry’s role in nurturing innovation, even though I know the Kauffman Foundation has a bit of an anti-VC bent. “The industry has become conflated with entrepreneurship in the popular imagination as well as in policy circles, with the result being a widespread and incorrect belief that venture capital is a necessary and sufficient condition in driving growth entrepreneurship,” writes Kedrosky. Kedrosky’s big data point? Of the 900 companies on the Inc. 500 list between 1997 and 2007, he reports that only 16% received venture capital backing. It’s an interesting data point. But to then argue that “venture capital and entrepreneurship are separate phenomena,” as Kedrosky does, seems like an overstatement to me. Obviously, most new companies do not require venture capital but the ones that do need it play a hugely important role in the economy because they tend to be the ones that grow the biggest and create the most value. Think Google, which got a $25 million injection of venture capital at a key moment in its evolution. Without that money Google might have never become Google. There are many examples like this. The rest of the report tries to figure out why venture capital performance has been poor lately and suggests how the industry will reshape itself. The upshot? The industry must shrink, perhaps in half in the coming years. I basically agree that the industry needs to shrink. That’s pretty much what I argued in my super angels feature. The industry has an inversion problem: Fund sizes have gotten bigger while the capital needs of companies have shrunk. $500,000 is the new $5 million, as Mike Maples said in my story. Will it shrink in half? Maybe. Maybe not. All I know is that it will get smaller and that’s a good thing for industry and for the economy. An excess of capital ends up wasting money and the scarce time of entrepreneurs to create great companies. The more important issue to me is that the industry needs to develop new models to finance and nurture innovation that fit today’s capital-constrained economy. Super angels will be part of the answer but it won’t solve the whole VC problem. My colleague Mike Mandel blogged about this issue, making the point that science-oriented VC requires more money and a longer time frame to come to fruition. I think he’s right. And I’ve heard many VCs who invest in clean tech make this point. Another big issue: Without an IPO market, there needs to be a new type of capital market that helps young companies finance their growth once they graduate beyond venture capital. Check out this review that Brad Feld, co-founder of the Colorado venture capital firm Foundry Group, recently posted on my Amazon page. Most people that have been involved in a VC-based tech startup have heard the parable of General Georges Doriot and his famous $70,000 investment in Digital Equipment Corporation. 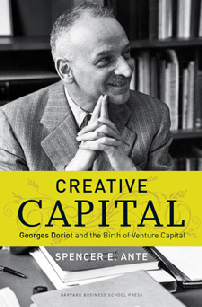 However, few people actually know the full (and very extensive) story of Doriot and the creation of the Venture Capital business. Spencer Ante does an awesome job of telling this incredible history. As a former entrepreneur and now VC, I’ve read many books that touch on parts of the history and have heard many anecdotes. Spencer brings them all together in one concise, well-written, fast paced book. Every entrepreneur and VC should, along with anyone that is involved in creating companies, should read this book. Yesterday, venture capitalist Brad Feld published a candid post in which he made the argument that entrepreneurs played a much more important than financiers in the startup ecosystem. Even though I wrote a book highlighting the importance of VCs, I totally agree with him. It’s the entrepreneurs that drive innovation. They are down in the trenches building the businesses every day. They create most of the value. However, without risk capital, the startup system ecosystem would be far less powerful and effective at generating innovation. You simply can not build a business without capital–even in these capital efficient Web 2.0 days. Look at any survey of a small business and the top concern is always money–having enough of it to run your day-to-day operation and getting more to grow the operation. One of the big reasons that America is the world’s engine of innovation is that we were the first country to develop a professional and robust venture capital market. Now, other countries are following us, but our risk capital market is still one of the nation’s competitive advantages. It’s also one of the reasons why I think we will lift ourselves out of this recession more quickly than we did in the Great Depression. There was no venture capital market in the 1930s. We have one now and the capital being put to work in startups will create companies and markets that will help grow the economy and revive our animal spirits. In fact, as I detail in my book, the VC industry was born out of the Great Depression when a group of businessmen in New England in the late 1930s realized the U.S. had created a “risk-less economy” and needed to find new ways of creating new companies. I struggled with this tension in writing my book. I was writing about a VC but I came to see that what I was really writing about was the birth of this startup ecosystem, the entrepreneurial economy. I was writing about the largely symbiotic relationship between the entrepreneur and the venture capitalist. You can’t talk about one without including the other. Sure, there will always be tensions between owners of a business and the managers. And that’s OK. But instead of pitting entrepreneurs against VCs I think it’s better and more appropriate to view them as partners in a mutually beneficial relationship. Today, BusinessWeek published my story based on an early and exclusive look at Fenwick & West’s survey of trends in venture capital financing from the fourth quarter of 2008. It’s the first survey I know of that digs into the gory details of the venture world from the end of last year when the recession gripped the economy. Like the rest of the economy, the world of venture capital and startups is starting to feel more pain from the deepening global financial crisis. That’s the main takeaway from a new survey detailing trends in venture capital investments during the fourth quarter of 2008 by the California law firm Fenwick & West. The survey, which analyzed the terms of venture deals for 128 companies headquartered in the San Francisco Bay Area, found that valuations are falling for startups and that venture capitalists are driving harder bargains. The silver lining: The fallout so far is not nearly as bad as it was during the dot-com bust, when hundreds of companies went under and stratospheric valuations came crashing down to earth. Sure, there were some startups last quarter that secured a higher value on their latest investment round, such as online vacation rental site HomeAway. But, of the 128 companies that received financing, 33% of them experienced so-called down rounds, or an investment that placed a lower valuation on the company than it received in the previous round of investment. More ominous, the percentage of down rounds rose every month at year’s end, hitting 45% in December. “Each month things got worse in the fourth quarter,” says Barry Kramer, the Fenwick & West partner who runs the survey. The highest percentage of down rounds occurred in the first quarter of 2003, when 73% of the companies surveyed by Fenwick & West suffered down rounds. BusinessWeek’s Digital Dish gang considers the sale of equity in Facebook by insiders, and what it means not only for Facebook, but for other venture-capital-backed startups, as well as predicting that China’s tight grip on information will encounter resistance at the Summer Olympics.